As investments in oil exploration and ancillary infrastructure development continue in the Middle East and Saudi Arabia, the demand for Saudi Arabia passive fire protection materials market will hold steady, says Transparency Market Research in its latest report. 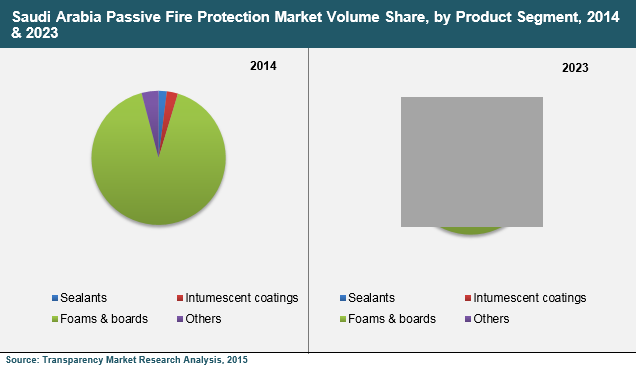 According to the report, titled ‘Passive Fire Protection Materials Market - Saudi Arabia Industry Analysis, Size, Share, Growth, Trends and Forecast 2015 - 2023’, the market’s valuation stood at US$89.7 mn in 2014, and will rise to US$131 mn by 2023, exhibiting a 4.40% CAGR through the forecast period. Passive fire protection materials comprise an integral part of building and site safety as they prevent fire from spreading, thus limiting damage. Passive fire protection measures are utilized in compartmentation, structural fire protection, fire-stopping barriers, and opening protection. Although the demand for passive fire protection materials will continue to grow in Saudi Arabia, the negative environmental effects linked to the use of solvent-based intumescent coatings will impede growth. To mitigate the impact of this market restraint, TMR analysts recommend market players to focus on innovation in fire protection techniques, especially for cables and wires. In order to present an in-depth analysis of the passive fire protection materials market in Saudi Arabia, the report divides the market into smaller segments on the basis of various criteria. Thus, the market is segmented based on product and application.By product, the Saudi Arabia fire protection materials market is composed of sealants, foams and boards, intumescent coatings, and others. Similarly, by application, the market has been segmented into mechanical and electrical, civil, structural steel fire proofing, duct, cable and wire tray fireproofing, and others. With a share of 90% in 2014, the foams and boards segment led by a remarkable margin in terms of volume. Calcium silicate boards are extensively used in buildings for passive fire protection. The study also finds that products in the others segment held a sizeable share in the market. Within the structural steel fireproofing application segment, the use of intumescent coatings was seen to be high in 2014. Structural steel fireproofing was the largest segment in the passive fire protection materials market by application, claiming 25% of the market in 2014. In the oil and gas industry, especially, the use of structural-steel-based fireproofing was the most widely used means for passive fire protection. Structural steel fireproofing is extensively used in pipes, tanks, and vessels – all of which are widely used in the oil and gas industry, which is the lifeblood of the economy in Saudi Arabia. In 2014, civil projects stood as the second largest segment in the Saudi Arabia passive fire protection materials market by application. For a complete overview of the competitive landscape of the Saudi Arabia passive fire protection materials market, the report profiles the following companies operating in the market: Conquest Firespray LLC, Darchem Engineering Ltd., Passive Fire Protection Partners, 3M Company, The Fireseal Group, Hilti Group, Electropar Preformed Line Products, and others.